Thought of as Chungha’s little sister act, the five-piece band held its media debut showcase in Seoul on Wednesday, where it performed the single for the first time in front of reporters, talked about the group’s relationship to Chungha and displayed its passion as a rookie group. Simyeong, Songhee, Yiyeon, Jungwoo and Seungeun explained that its group name “Bvndit” (pronounced “bandit”) stands for “Be ambitious and do it.” Debut single “Hocus Pocus,” tinged with smooth moombahton -- a fusion of house and reggaeton -- and trap rhythms, also delivers the act’s hope to captivate anyone who listens to the song. 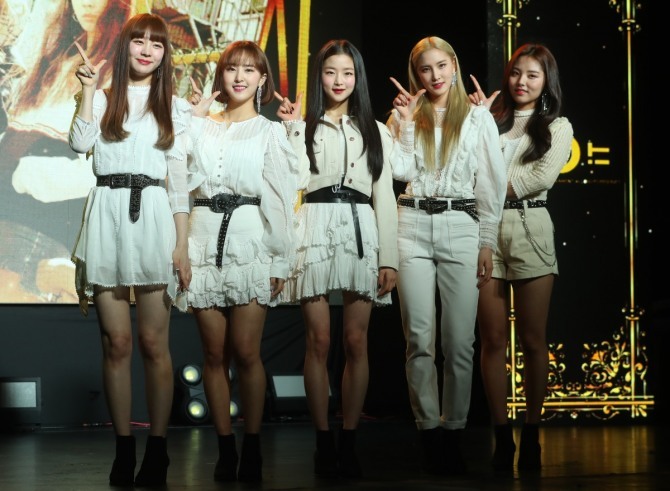 During a press conference, Bvndit received several questions about its connection to senior labelmate Chungha. Prior to the group’s debut, the act had already received a share of the spotlight for becoming the first to follow sole MNH act Chungha. “Chungha is recognized as a very talented act, and we felt burdened when people called us ‘little sister group of Chungha.’ But thanks to it, we could have practiced a lot,” Yiyeon said. Jungwoo also shared that she practiced singing live while exercising in the plank position. Overflowing with energy, Bvndit managed to fill the hourlong showcase with laughter and a cheerful vibe among the nerves and excitement in the room. While performing “Hocus Pocus” live, Jungwoo accidently dropped her microphone due as she performed her powerful dance movements, but she kept things professional, quickly regrouping and keeping her vocals stable. When it came to the act’s role models, the bandmates said they look up to girl group Mamamoo and boy band BTOB. “We have great respect for Mamamoo and BTOB as they know how to enjoy themselves on stage. Seeing how the Mamamoo members make eye contact with each other while performing makes us want to become a group like them,” Yiyeon said. “We hope to become a group that keeps arousing the public’s curiosity,” Seungeun added.